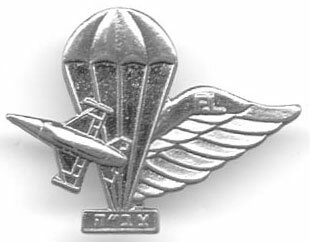 Insignia of the IDF air force rigger unit. The Israeli air force started in the early 1940's with a few small planes, signifying the resurgence of the Jewish people in their return to their own land. This air force has saved the Jewish people from complete destruction and conquest on a number of occasions, specifically during the 1967 six day war and the 1982 bombing of the Iraqi nuclear reactor. Thanks to the great discipline and value for life taught to all those who fly these planes, the Jewish people have displayed their indomitable spirit of humanity and the will to survive and to flourish in their own land. Purchase one or more of the well known tags and pins of many famous air force units, to keep as souvenirs or to frame and display in your home.